Perhaps one of the most difficult aspects about an addiction to drugs or alcohol is the sense of hopelessness that often develops. Individuals who struggle with addiction may often find themselves in circumstances that are bleak and despairing, leaving them little to hope in or aspire towards. Instead of dreams and goals, addicts are often consumed by figuring out when and how to get their next fix or coming down with the side effects that are involved with drug and alcohol abuse. For many people who find themselves struggling with an addiction to drugs, the many hopes and dreams that once were are often diminished, sacrificed, and forgotten. The recovery process from addiction is one that involves multiple aspects, many which help a person heal from the inside out. For addicts who have relied on drugs or alcohol for any length of time, letting go of the crutch of an addiction can be scary and overwhelming. In place of aspirations, addicts often find temporary security or a means of escape through their drug or alcohol abuse. Learning to let go of this in addiction recovery and treatment can be unsteadying, but this process can help an individual find true hope and meaning once again. Letting go of the false pretense that addiction is “hope” or security is an important step towards truly finding and experiencing freedom from addiction. However, this step cannot be achieved unless there is an intervention with dangerous addictive behaviors. A person who is addicted to drugs and/or alcohol will likely need to go through a period of rehabilitation in order to safely withdraw from the substance to which they are addicted. Learning to find true hope and meaning again cannot begin to happen until cognitive and physical function is restored in the body. Until this point, addicts may not see that they are lacking something in their lives or even that they have compromised who they are or what they believe for drugs/alcohol. 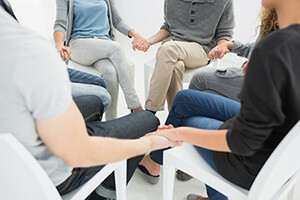 After mental and physical stability has been achieved in the recovery process from addiction, this may be a more appropriate time to integrate faith-based practices in addiction recovery. Reestablishing hope and faith in a higher power can be grounding and give a recovering addict a new sense of purpose. Some addicts may find that finding faith through recovery and treatment is also helpful in renewing their sense of morality. In some instances, an addict may compromise what they believe in or moral standards in order to obtain the drugs/alcohol they are addicted to. Finding faith in something higher than oneself can be a moral reset for recovering addicts who may feel as though they have lost themselves or the things that are important to them. If you are a recovering addict, be sure to consider the importance of faith and hope in your recovery journey. Hope can be found through multiple ways, and though it may be frightening to let go of all you knew through the lens of your addiction, you will gradually begin to see and remember the things that are truly important outside of the addiction. Reestablishing your faith may be hard to find while you are recovering from addiction, but it is important to know that it is possible. Building your life up again after struggling through an addiction is not an easy process but it is something that will be rewarding and invaluable as you learn to find you way through the challenges and obstacles. Leaning on the support of professionals and loved ones can provide you with a solid foundation of encouragement and hope. While you may feel alone through your recovery journey and even as though you want to give up at times, remember that faith is restored one small step at a time. How has faith played a role in your life and in your recovery from addiction? What has allowed you to maintain your faith during times of difficulty or uncertainty? What encouragement might you share with others who are struggling to find hope?